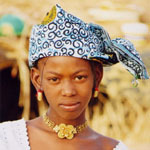 West and Central Africa embraces 24 countries with more than 500 least-reached people groups remaining. 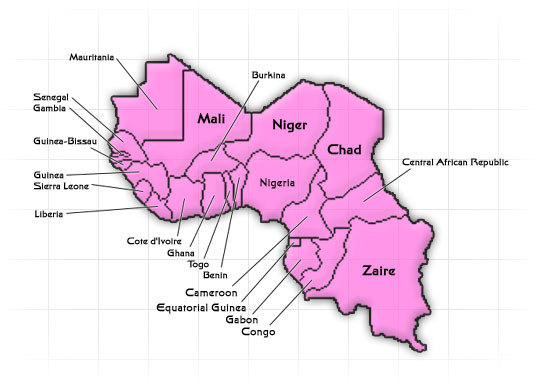 The countries of Senegal, Mali, Guinea, Gambia, Mauritania, and Niger lead the wat with over 80% of their populations least-reached. Still, in terms of number of people, Nigeria has over 56 million people least-reached, although they represent only 33.8% of the total population of that nation. Islam had already reached the powerful tribes of West Africa long before the French colonized much of the region during the 19th century. For many centuries, Islam was the religion of the chiefs and elite since Arabs were primarily interested in profiting from the slave trade and not interested in making converts. When slavery was forbidden by the colonial powers, Islam spread faster in 50 years than it had in the previous eight centuries. Yet, Islam here is only the 5 pillars of Islam on top of their animistic traditional religions and animistic practices are particularly diverse. Here you will find voodoo, fetishes, ancestor worship, and idolatry. The church has grown rapidly especially in places like Nigeria which is now also a sending base for missionaries to other continents, but a great challenge remains every in their midst. AIDS in Africa now overshadows the future of the entire continent and added to that, the specter of poverty looms large over much of this region. Pray that God empowers our brothers and sisters in this region to rise to the challenge with good news and good works leading to transformations. Pray that miracles of healing and deliverance even for those battling HIV/AIDS would open doors for faith among the more than 500 Least-Reached Peoples of West and Central Africa. Pray that believers walk in the Holy Spirit’s power over all demonic depression, oppression, and attact of every sort, demonstrating that Jesus is truly King of kings and Lord of lords on earth and in heaven. Pray that Least-Reached Peoples recognize that Jesus is the Lamb of God, the once-for-all sacrifice that forgives all our iniquities and heals all our diseases and that they apply this finished provision to their lives. Pray that believers apply their authority in Jesus Christ to bind all backlashes of the enemy as they work to penetrate the strongholds of darkness to deliver the captives and see them transferred to the Kingdom of Light of God’s Dear Son Jesus. Pray that generational curses that have come as a result of idolatry, immorality, injustice, and independence from God will be broken and believers walk in the true freedom of Jesus Christ as a testimony to those who do not yet believe.